The navy living room is one of the defining masterpieces of ‘Scandi Noir’. A moodier rendition of an interior trend that is most often associated with light, airy colours. There can never be too much white or soft-focus grey in minimalism. But right now interior stylists are turning Nordic design on its head and moving over to the dark side for something more sinister, more seductive. Navy can be a disconcertingly dark hue to work with and for many, it’s perhaps a little too masculine. But balanced with the right colour accents and applied in the right way, it can transform your space into something spectacular. This bold colour really is full of elegance and charm. Here’s why you need to consider navy for your next living room redesign, and some tips on mastering the trend on a budget. Despite this dark, dingy hue being shockingly different to anything else seen in Scandinavian interior design, it’s actually a bit of a classic. Like black (but much less morbid), the beauty of navy blue walls can last forever. In colour psychology, navy portrays trust, stability and confidence. So in a way, it’s a very safe colour to choose for your walls or furniture. Table and chairs available from Furniture Choice. Unlike other trend colours that come and go, navy will always look chic and stylish. It also matches well with furniture from every decade or era – from vintage pieces to ultra-contemporary. Don’t get rid of your white minimalist furniture and décor. Navy and white create a striking contrast and can help to keep your room feeling light when it’s dark outside. If you already have Nordic influences in your home, the navy living room trend could be a fantastic upgrade. Mixing and matching is so easy with navy and dark blues. So you won’t have to worry about your living room lacking dimension. Navy is considered to be a base tone, giving you as much design versatility as black and grey. Bright red, white, rustic orange, mustard yellow or ochre, deep pinks and fuchsia, purples and magenta, pine green and army green are just a few palette ideas to get you started. Chair, footstool, curtains and cushion all James Hare. This year, the most popular hue to covet is coral, and it’s perfect for adding a pop of colour to a muted navy living room. The cheapest way to add contrast in your home is with soft furnishings, such as cushions and lamps. Or to keep things interesting, opt for a geometric wallpaper pattern. This will break up any solid colour reservations you have. 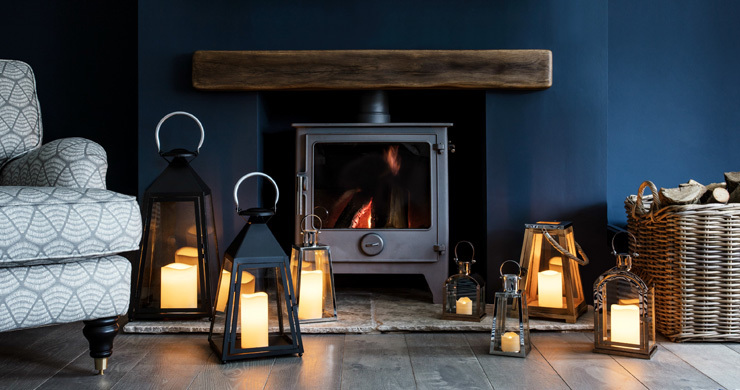 Don’t just stick with pure navy if you’re worried about your home looking too dark and moody. Different shades of blue sing harmoniously together. Experiment with seasonal wallpapers, fabrics and patterned rugs. Swap things in and out according to the ambience you want – introduce cobalt or Prussian blue for winter and bring in pale duck egg for the summer. 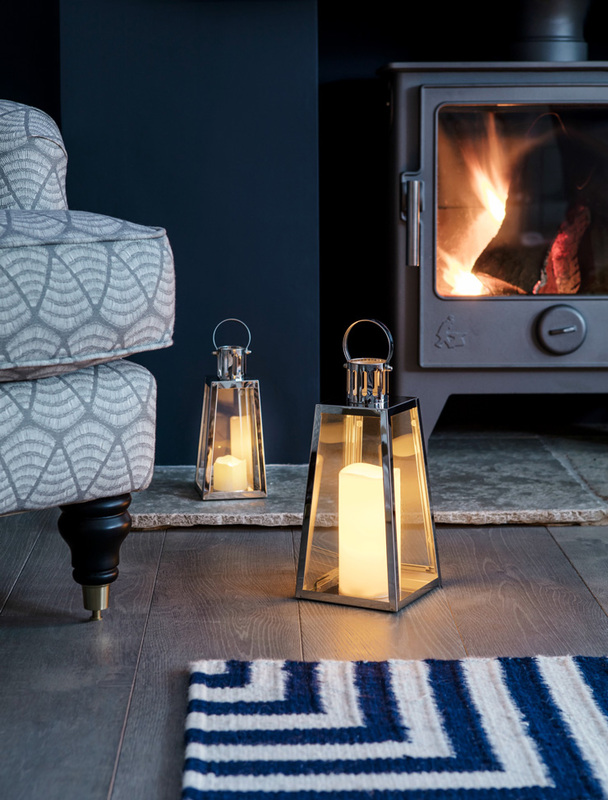 Save on lamps and extravagant light fittings with LED lanterns instead. These are wonderful for creating atmosphere, and quickly fill those empty spaces on floors, tables and surfaces. 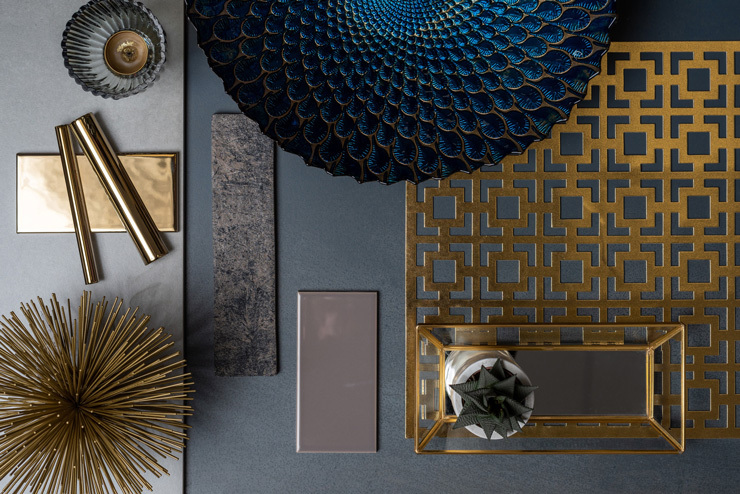 By choosing silver or gold metal finishes, you can bring out the different hues of blue in your room. Mural in image: Flowers and Doodles by Valentina Harper. 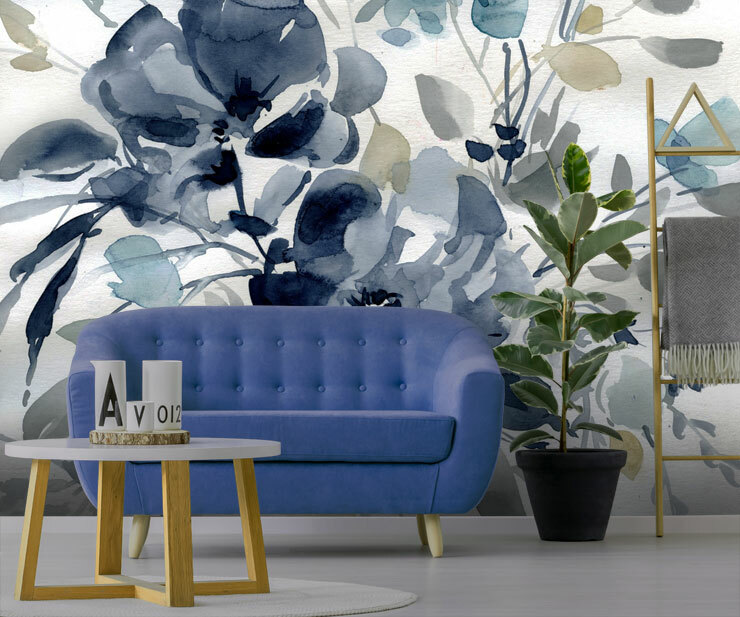 Additionally, if you’re worried about the use of solid colour, work with patterns or contemporary wallpaper designs that keep your design exciting. If you have a large living area that leaves you a little cold in the wintertime, navy can be a great way of warming up the space. Cyan, turquoise and baby blue are cooling colours, making them perfect for opening up a tight room. But when your ceilings are tall and floor space ample, darker blues can help you strike a balance. Three seater sofa available from Furniture Choice. Mix and match with dark wood or honey coloured oak, and use gold accents to build a bit of interest. 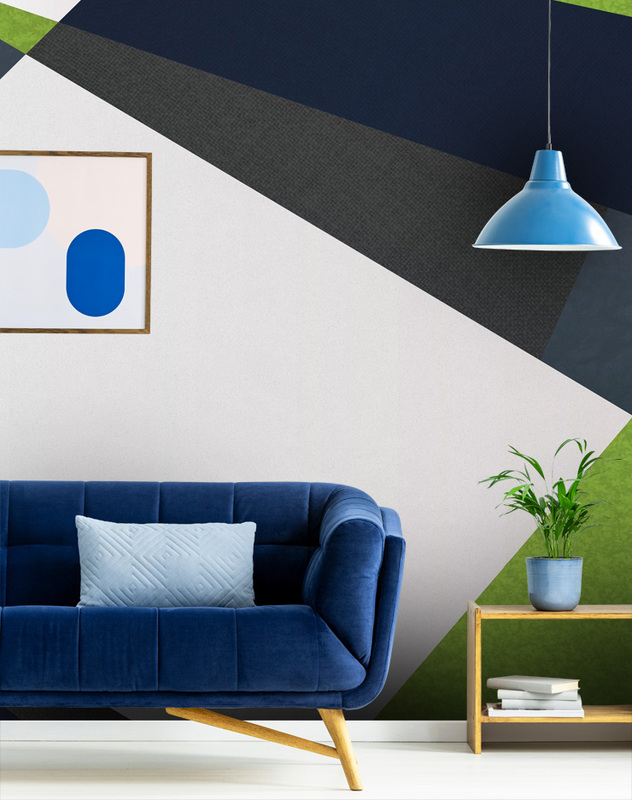 If you’re not too confident about painting your entire living room navy, opt for a feature wall instead. Adding depth to dark walls can become an expensive project. Contrasting décor pieces such as pottery or picture frames really add up. 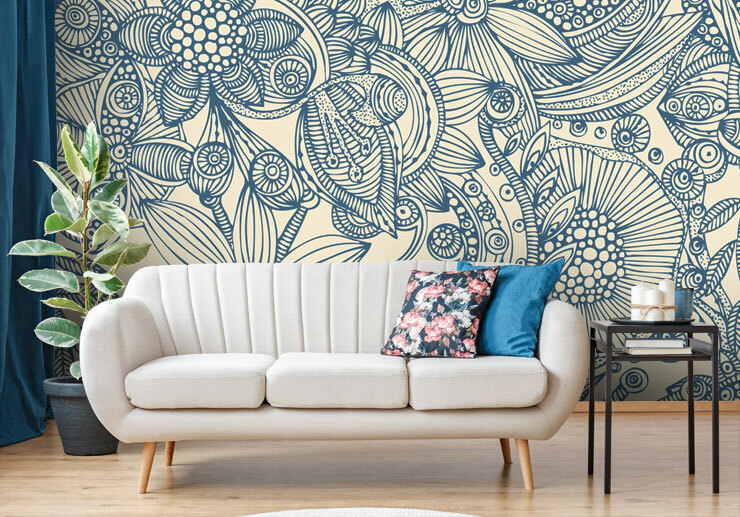 But you can keep your spending under control by choosing patterned wallpapers or a mural design with illustrations – these add another dimension without the need for expensive designer items. Mural in image: Indigo Garden 2 by Carol Robinson. With a lick of navy wall paint, everything looks instantly more expensive. This is the most grown-up colour in the Pantone book, and it takes a good eye to carry it off. Do the navy living room trend well and your home will ooze luxury, not darkness. 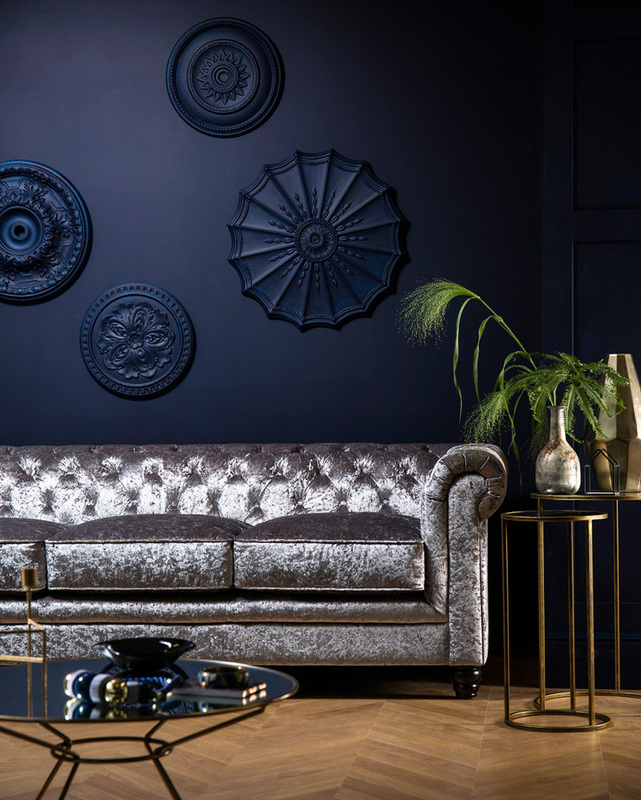 Incorporate luxe fabrics, such as velvets, silks and tweed. Or add a touch of millennial elegance with the addition of gold, silver or rose gold. Image supplied by Original Style Ltd. If you paint all sides of the wall in navy, make sure your furniture contrasts well, and use mirrors and reflective surfaces to bounce light around the room. Fans of indoor botanical gardens will also find navy to be a sophisticated backdrop for their plants. Ferns and palms have never looked better. Don’t splash out on a total refurb if you’re on a tight budget. 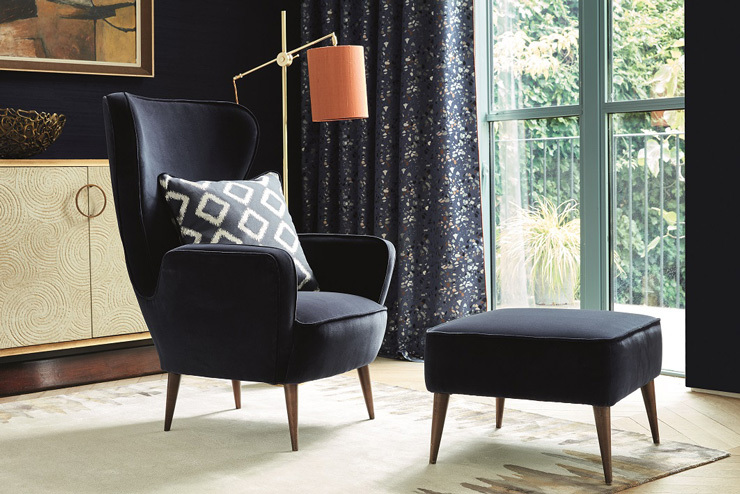 Start off your navy collection with a few key furniture pieces, like a mid-century mod chair or some gorgeous blankets and throws. You can build up your range over time, using different textures and colours to layer. Armchair available from Cult Furniture. Throw available from Hurn & Hurn. Do you love or hate these navy living room ideas? The ‘Scandi Noir’ colour palette can be divisive in the design world. Some consider it too dark, whilst others think it’s the chicest trend since marble. Let us know your thoughts in the comments below.